Ferns are a superb woodland plant that grows wonderfully in shaded areas and protected garden beds with adequate moisture and well drained soil. 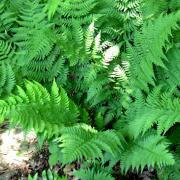 There are many types of ferns, all add terrific texture, movement and foliage to a perennial garden. The new leaves emerge each spring with the rich bronzy red leaves that later turn to bronze and then green again. 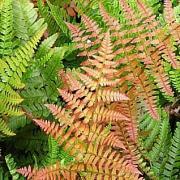 It is one of the most attractive ferns for the garden, as the leaves are a dark glossy green throughout the summer and winter. 2'x2'. Open, fountain shaped plant, fast growing to 3 ft. tall and as wide. Fronds are light green. Full to partial shade, semi-evergreen. 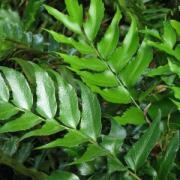 This hardy, evergreen fern grows12” to 20” with leathery, dark green, shiny fronds. requires medium to high light. Moist-dry soil. 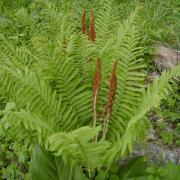 Fronds are cinnamon-colored, narrow and erect. round and slightly grooved, at first covered with cinnamon-colored hairs, later smooth and green. Height 2-5 feet.